If you are missing teeth, dental implants are the best replacement option. Implants are titanium posts surgically placed into the jawbone to replace lost tooth roots. Get a comprehensive and customized dental treatment that combines multiple dentistry procedures such as teeth whitening, placement of dental veneers, dental bonding, or dental implant placement and restoration. Modern dentures can be crafted to look absolutely natural, providing a precise and effective complement to a patient's facial structure for comfort, functionality, and aesthetics. Dr. Levy received his Bachelor of Science in Biology in 1974 from New York University. While at NYU, he also pursued advanced research in organic chemistry. Dr. Levy attended New York University College of Dentistry, earning his D.D.S. in 1977. 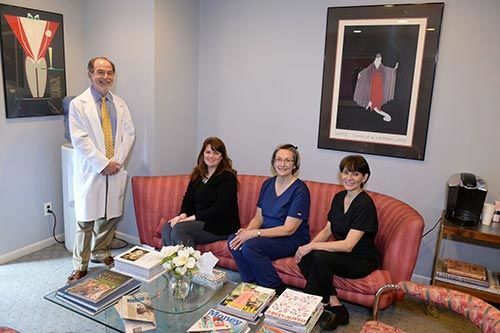 The doctor held a post-graduate general practice residency at Monmouth Medical Center from 1977 through 1978 and served on the dental staff in the Department of Dentistry from 1979 to 1999. In July 1983, Dr. Levy was awarded Fellowship in the Academy of General Dentistry (F.A.G.D.). He has been a member of the Seattle Study Club since 1997. He holds memberships in the American Dental Association, New Jersey Dental Association, Monmouth-Ocean County Dental Society and the American Academy of Cosmetic Dentistry. Dr. Jonathan Levy is a family dentist who has helped patients in the West Long Branch, NJ, area achieve beautiful, healthy smiles since 1979. We work closely with every patient to identify his or her needs and recommend the treatment or combination of treatments to provide excellent results. Dr. Levy is known in his field for being ahead of the curve when it comes to adopting state-of-the-art procedures and tools to help his patients achieve outstanding oral health. From the moment you walk into Dr. Levy's newly remodeled office, you can expect to feel welcome and comfortable. "I feel so privileged to have had Dr. Levy as my dentist for more than 30 years. Over this period, I have experienced the wonderful expertise and aesthetic sense he brings to restorative and cosmetic dentistry, as well as more routine general dentistry. He combines this state of the art knowledge and competence with genuine empathy and caring. I appreciate that whenever possible, he'll aim for the most conservative and cost-effective solution, and will always take the time to fully discuss the available options. Dr. Levy’s very warm and supportive staff, Kim, Ruth and Lydia, further contribute to a welcoming and reassuring environment." "Dr. Levy and his staff are simply the best dental care you can get." "Excellent Dental Practice in all regards. The atmosphere is friendly and immaculate, Dr Levy is a gentle and caring Dentist, and his staff is equally warm and always make you feel relaxed and comfortable. A++"
"Dr Levy and staff are exceptionally knowledgable, considerate, and technically superb. I have been a patient with Dr Levy for well over 30 years. The quality of care is excellent. One is treated like a person and not a number. And the icing on the cake--- in all of these years I MAY have had to wait 10 minutes! I highly recommend Dr. Levy and his staff." Dr. Jonathan Levy is a family dentist who has helped patients in the West Long Branch, NJ, area achieve beautiful, healthy smiles since 1979. Under his care, patients receive expert treatment, friendly service, and long-lasting benefits. He is known in his field for being ahead of the curve when it comes to adopting state-of-the-art procedures and tools to help his patients achieve outstanding oral health. Dr. Levy also takes part in ongoing education to constantly refine his skills and provide the best possible treatment. Copyright © 2017 Dr. Levy. All Rights Reserved.